Make 1 highly liquid stock or Index your primary instrument for trading & NEVER miss a trade in it. Know every move, every level, every behavior of that stock/Index. This sheer focus will yield the results you are craving for all these years. Mine is #BankNifty. What's yours? Glad to see so many response. Good that many of you have chosen at least 1 primary stock/index to trade. Every stock behavior is different so u need to develop a unique strategy for each. What works on #ICICIBANK may not work on #TCS or #MARUTI. Find that behavior & have an edge! Some people asked my fav list of stocks. Here are 15 highly liquid stocks/Index (mainly in Options) which I keep a track on. 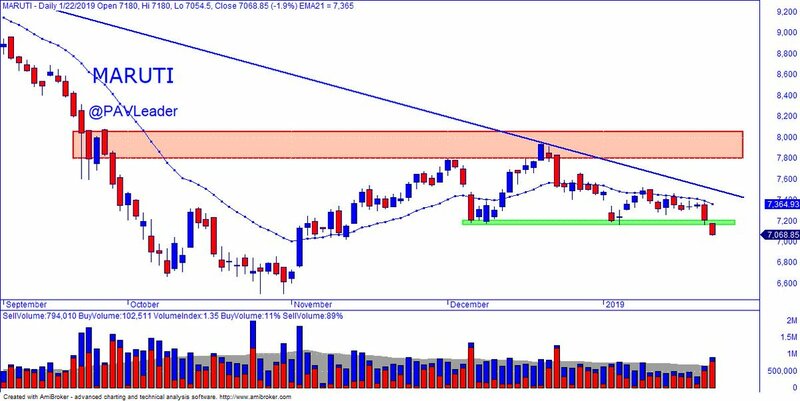 #MARUTI all targets met. Over exceeded the expectations. This call is closed. Hope you enjoyed! Humongous shareholder wealth is generated when industry attractiveness & competitive advantage join forces. However, it’s the sustainable competitive advantage (moat) rather than sector fancy that plays a bigger part in superior profitability & long-term wealth generation.